All purchased stock items will be shipped within 2 working days, excluding Sundays and UK Bank Holidays, via Royal Mail First Class Signed For or International Signed For & DPD. Other specific items may be shipped by other couriers. We choose to use Royal Mail DPD as they’re very reliable however, this service can take up to 14 working days before the item can be declared as lost in the post. Not all items are always in stock so, therefore, we try our hardest to advise where appropriate the delivery times, if the delivery times are NOT advertised on the listings advert then please take a look below as they will need to be ordered direct from the manufacturer. BACKORDERS: All purchased items advertised as "Available on back order" may take 4-10 weeks delivery, we have new stock arriving daily so if there is an item you require which is advertised "Available on back order" please contact us for specific delivery times. Vulturbike decals: Please allow 10-14 days for delivery as all are made to order. Conquest Racing Ltd Fibre: Unless stated "available on back order" (see above) then parts are in stock or will take 1-7 days for UK delivery. Fullsix Carbon Fibre: Most parts are in stock (in-stock/Available on backorder notification will be shown on each listing) if there is not a notification then parts are made to order, please allow 2-4 weeks delivery & 4-6 weeks minimum at peak season for UK delivery. Ducabike: We order direct from Ducabike on a weekly basis, 99% of parts are in stock so please allow 7-10 days for UK delivery. Evotech Performance: All parts are ordered direct from the factory. If available delivery will be 2-3 days UK, if the product is on back order please allow 3-4 weeks. Malotti Racing: Most parts are in stock but other items can take 2-3 weeks for delivery. Spider: We order direct from Spider on a weekly basis, 99% of parts are in stock so please allow 7-10 days for UK delivery. Puig: All items in stock will show in green or red, any items which do not have this notification please allow 7-10 days delivery. If they are out of stock or on back order at the factory we will let you know of a delivery date. INTERNATIONAL SHIPPING: Please allow up to 28 days before the item is considered lost. Conquest Racing Ltd cannot be held responsible for any customs duty having to be paid by the purchaser, if you are unsure of import duty to your country please seek the right information before purchase. SHIPPING COSTS: We only charge what we feel is the minimum rate acceptable, the cost isn't just calculated on the price set by our couriers but also the cost of packaging and transport. RETURNS: If for any reason you are unhappy with your purchase, we agree to refund you in full upon receipt of the returned item or replace it within a period of 30 days by prior agreement. Postage costs may also be refunded once a case is reviewed. Please see Terms & Conditions for further information. FEEDBACK: We really appreciate your business and hope you are delighted with your new purchase. 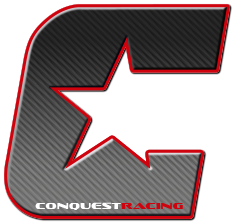 In the rare event you are not happy for any reason at all, please let us know as soon as possible sales@conquestracingltd.com or +441258 480934. Your provided feedback is extremely important to us as it helps drive our business forward.